UEFA president Aleksander Ceferin vowed on Wednesday to fight any “blackmail” by Europe’s most powerful football clubs over the Champions League. Ceferin took a tough line against Europe’s top leagues, angry at having been excluded, in their opinion, from talks on the future of the world’s biggest club tournament. 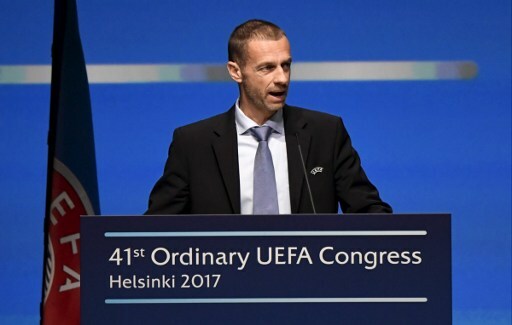 “To some clubs, I shall say it calmly and dispassionately, but firmly and resolutely: there will be no closed league,” Ceferin told a UEFA congress in Helsinki. “Quite simply, that is not in line with our values and ideals. “To some leagues, I shall say it calmly and dispassionately, but firmly and resolutely: we will never give in to the blackmail of those who think they can manipulate small leagues or impose their will on the associations because they think they are all-powerful on account of the astronomical revenues they generate. “Quite simply, money does not rule and the football pyramid must be and will be respected,” said the Slovenian, who has been president for less than a year. The European Clubs Association announced last week that it had agreed changes to European competitions with UEFA and ended calls for a Super League reserved for the wealthiest clubs. But a deal between the European Professional Football Leagues and UEFA to avoid clashes between Champions League or Europa League matches and domestic league fixtures ended on March 15. In theory, the 25 EPFL championships can now organise games at the same time as UEFA competitions. Cerefin also vowed to do what is necessary to guarantee the future of the game and to do so in a transparent manner. Ceferin singled out the case of choosing venues for big matches. “We have to make sure there is a fair procedure for choosing sites for all UEFA games in all UEFA competitions, to make sure there is a clear and transparent tender,” he said. The EPFL is to hold a special congress in Geneva on June 6 to discuss the tensions with UEFA.